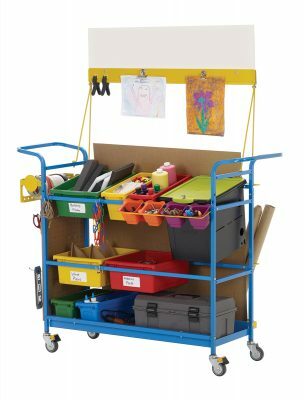 Whether your makerspace is located in one place or is always on the move, eventually you’re probably going to want to invest in a storage cart or two. 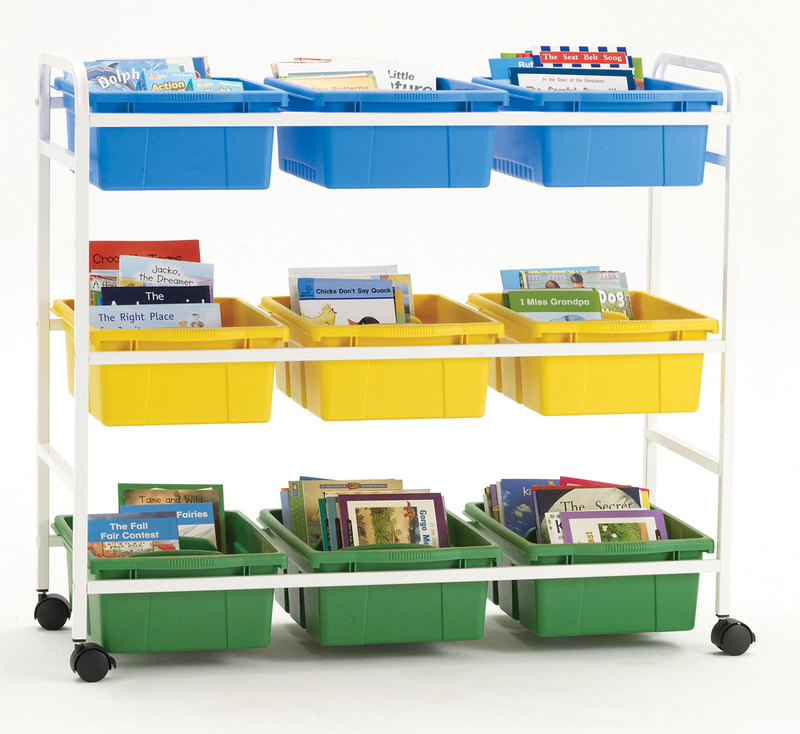 Moving bins of supplies around can work for a time, but a cart allows you to more easily move supplies and increases access to them, which leads to more making. The market is filled with lots of excellent maker carts, which can make the task of choosing the right one for your space daunting. Below you’ll find three things to consider when choosing the right makerspace cart for your space, as well as some of my favorite carts. You want this to be something your students will actually use. If you decide on a cart on your own before you get student feedback, it’s going to be hard to get them to utilize the tools and clean up after themselves. If you have a student leadership team in your library, gather them together. Or, ask for volunteers from your makerspace regulars. Have a brainstorming session where you discuss how the makerspace is used, what problems students are noticing, and how those problems could be solved. Bring them furniture catalogs or screenshots or send them links to different makerspace carts. Or even better, get your students in on the design process themselves. Have them create prototypes of their ideal storage solutions. Then look for something similar. The main thing is to get your students involved in the decision-making process. 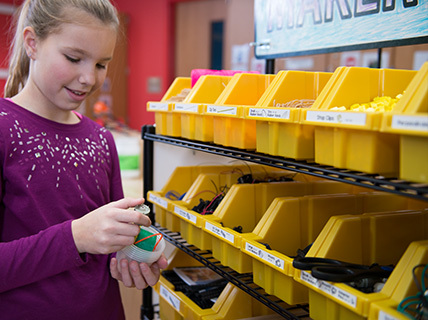 Not every maker cart is perfect for every makerspace. 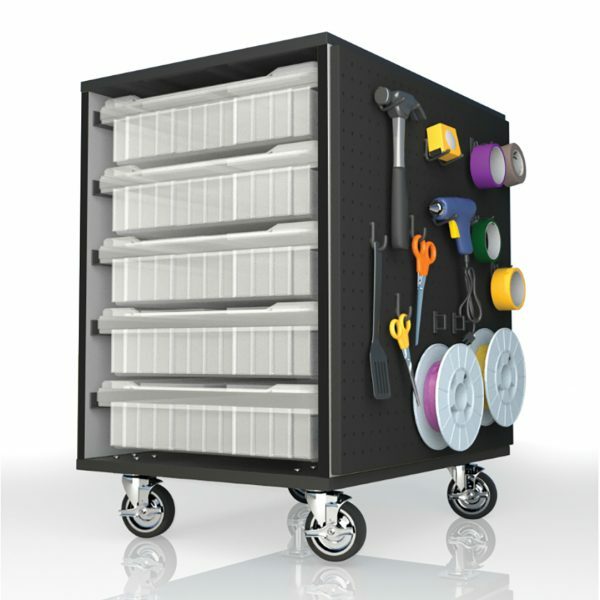 You might end up realizing that you need different carts for the different types of tools and supplies in your space. A cart that does a fine job of storing tiny ARDUINO® parts won’t work so well at storing large sheets of cardboard. 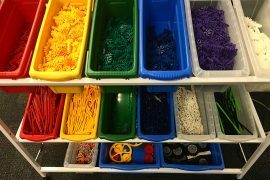 Using colored bins to separate LEGO® bricks and K’NEX pieces makes sense, but it might not make as much sense for batteries, LEDs, or copper tape. Spend some time writing down the different tools and supplies you store (or are planning to store once you get them). Think about common threads and which tools and supplies logically go together. Maybe one cart will be geared toward circuits while another will have building and crafting materials. 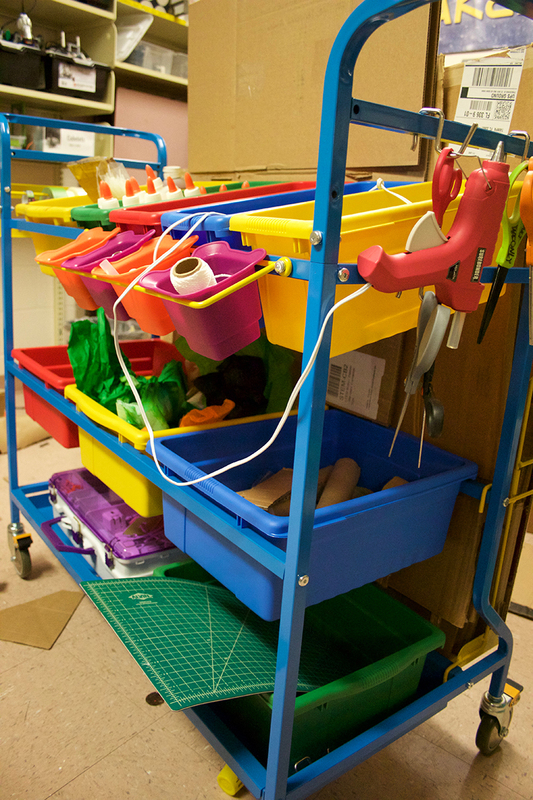 Mobility: How easily does your makerspace cart need to move? Will it stay in one place most of the time or will you be frequently rolling it into classrooms? In general, smaller carts are going to be easier to steer and maneuver. 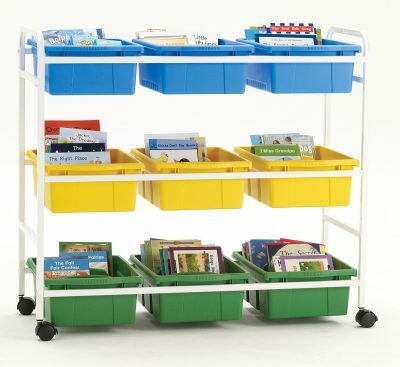 But if the cart is mostly being used to organize materials in a set place, this may not matter much. Lockability: Do you need to be able to secure the materials to the maker cart itself? Will the cart be stored in an insecure location, or will you be able to lock it up during nonschool hours? Some carts are created with locking covers that prevent access to materials. Many are open storage. If you are storing expensive items in the cart, such as robots or other high-tech tools, lockability might be a necessary feature. Size of Space for Storing the Cart: Do you have a room to store the cart in? Does it have to fit underneath a set of shelves? 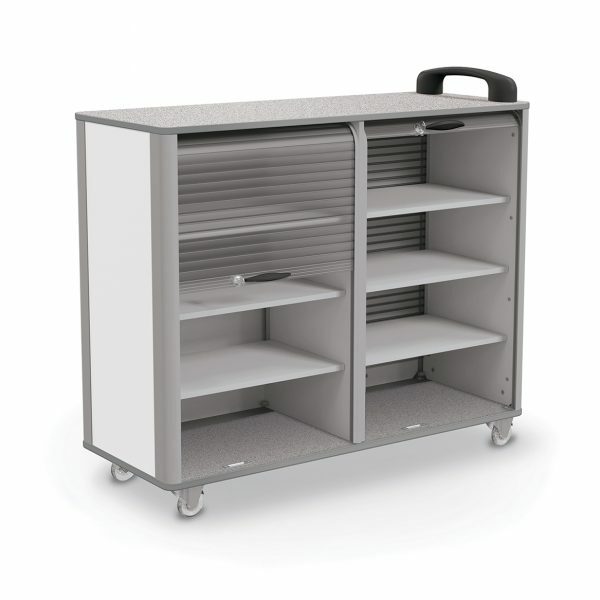 The amount of space you have might determine what size makerspace cart you can accommodate. Size of the Items You Want to Store: Are you looking to organize large amounts of materials in big bins (e.g., recycled materials)? Or do you have a ton of tiny pieces and components that need to be organized in smaller bins? 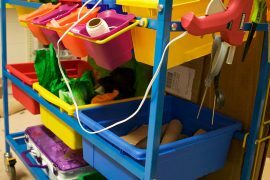 Will students grab bins and take them to their workstations or will they grab their supplies straight from the bin? The answers to these questions will factor in to which style of maker cart will work best for you. This is my favorite maker cart for storing LEGO bricks and K’NEX. 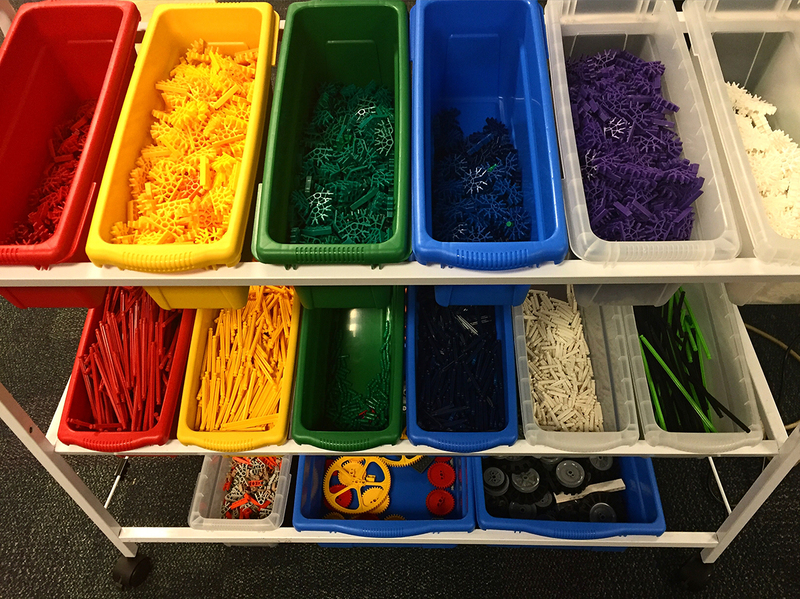 I used the smaller bins to color-code different K’NEX pieces and the larger ones for the LEGO bricks. These carts can roll around pretty easily but also stay put when you need them to. Students can access them from all sides, which allows multiple students to use the supplies simultaneously. They don’t lock up, though, so I use different storage for more expensive supplies. This is an amazing cart designed specifically for makerspaces. My favorite aspect of this makerspace cart is the bulk storage on the back — it’s perfect for storing cardboard. It accommodates bins, hooks, and other organizers, and you can also choose to upgrade and get a whiteboard and signage. It has a great set of wheels, making it easy to move. Many of our libraries and classrooms are pressed for space, so having organizational furniture that can pull double duty is a huge plus. These mobile benches serve as a storage place for supplies or projects and double as seating. They also have a locking option, which is great if you need more security. Since they double as seating, these benches are a great choice if your makerspace serves other functions throughout the school day. And — because mobility is key — they’re on casters, making it easy to move them around and adding more flexibility to your space. I may be a bit biased about this one, since my students designed it. 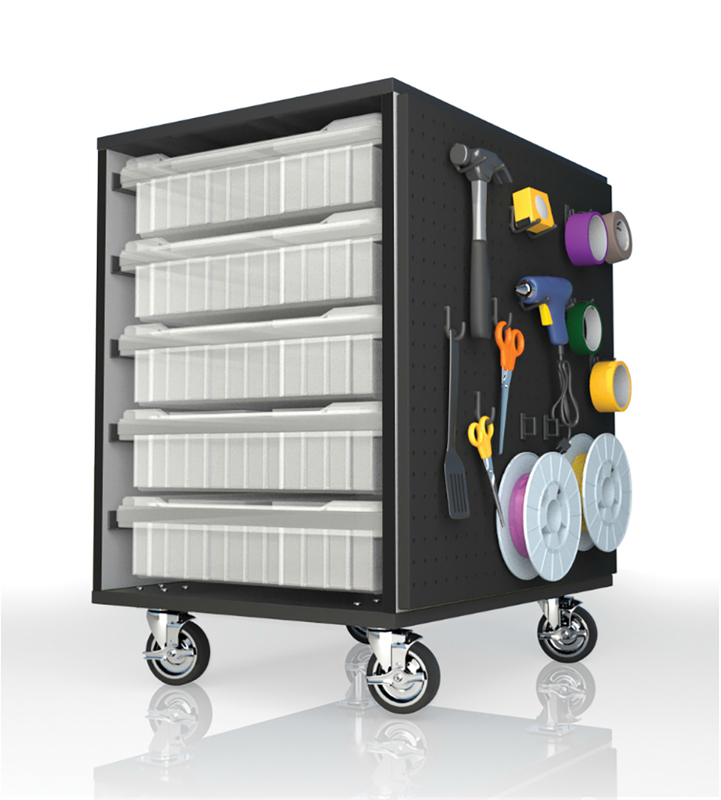 It’s a small, mobile maker cart with lots of storage options in the bins, as well as pegboard sides that can hold a variety of tools. 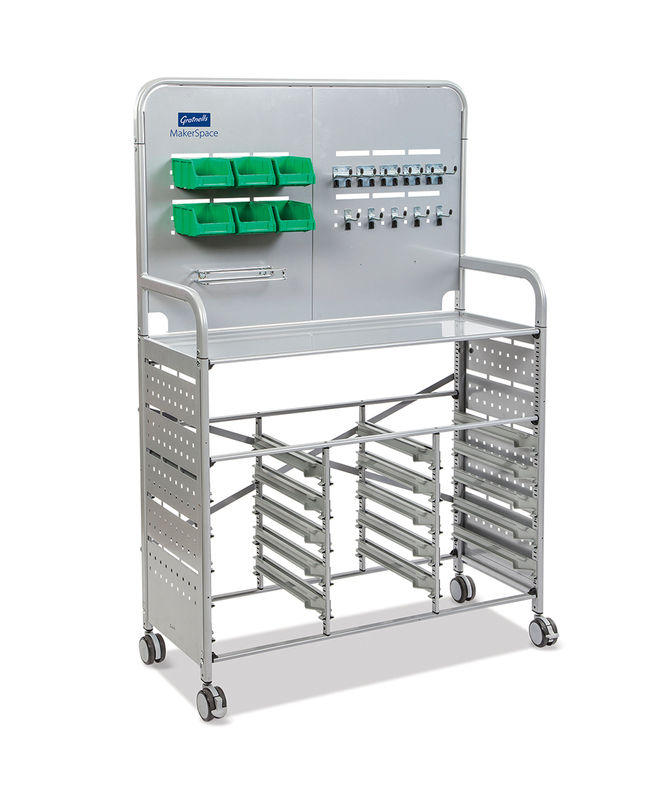 It’s great for smaller organization and would work well for organizing tools around specific project types, such as having one cart for circuit-related projects, another for craft projects, etc. You could then roll out the cart with the supplies you need. Gratnells has been around for a long time, and their bins are high quality. 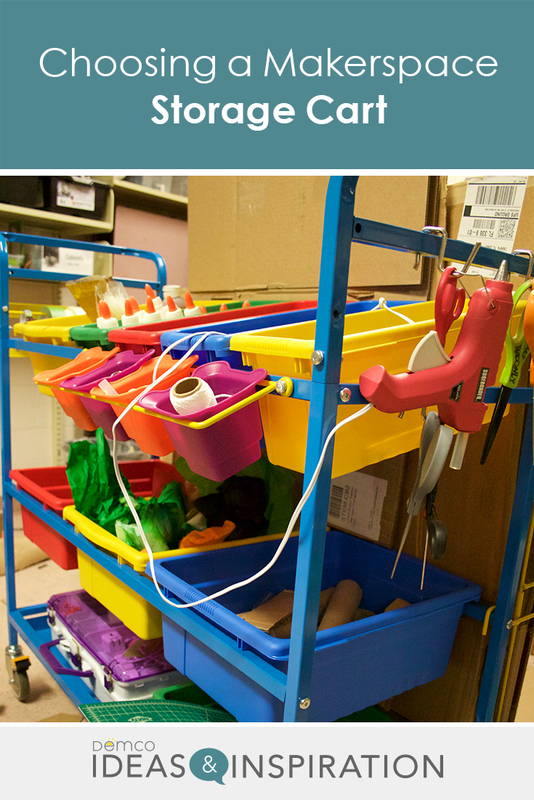 This makerspace cart is a great option for keeping all of your supplies organized together. 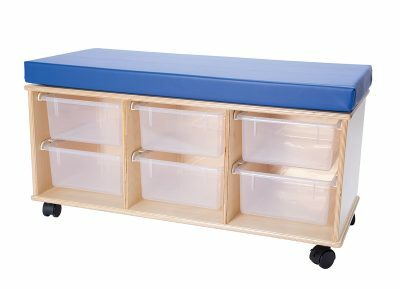 Since it also includes a workspace, this is a great option for a smaller maker station or a mobile makerspace that moves around. 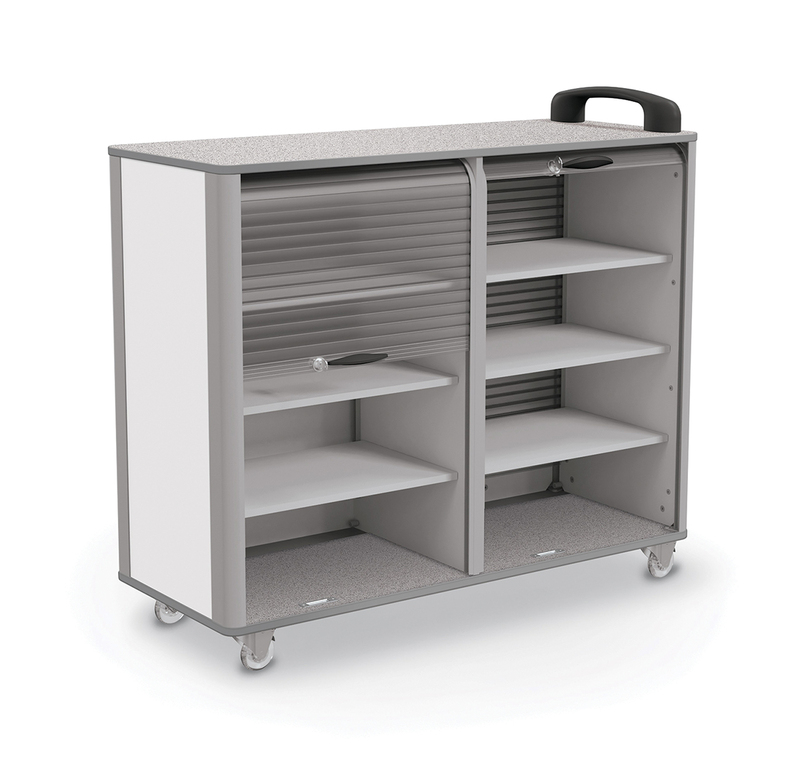 Originally designed for robotics classrooms, this locking storage cart is perfect for makerspaces that are out in the open but still need to be secured. If security is your top priority, this is definitely one to consider. As you search for your perfect maker cart, remember to keep in mind your priorities. 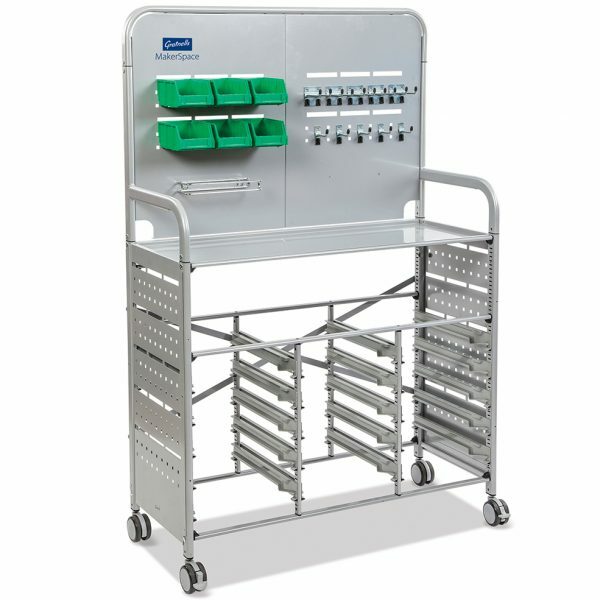 And don’t be afraid to use a variety of carts for different purposes. Ultimately, our goal is to get supplies into the hands of our students to spur on their creativity. If the makerspace cart you choose does that, it’s a win in my book.